Inner elf discovery begins with the right costume! Transforming your little Grinch into an obliging little festive helper might feature on your annual Christmas wish list, but is not easily achieved in a couple of hours. Why not spend an evening sewing up a cute elf costume for her instead? Then pop it on your child and wait for a Christmas miracle! Cut a zig zag shape along the bottom hemline of an over-sized green T-shirt and along the hemline of each sleeve. Place a piece of dressmaker's tracing paper over the T-shirt's neckline. Draw a collar shape that follows the shape of the neckline with a zig-zagged bottom edge. Cut out the collar pattern and pin onto a piece of red felt. Cut out the felt collar. Pin the felt collar over the front neckline of the T-shirt and stitch into place. Sew three large red buttons in a vertical line on the center front of the T-shirt. Elf tunic done. Time to create an elfish-looking hat! Draw a triangle that has a base length and height of 13 inches on dressmakers' tracing paper (Ref 1). Cut out the paper pattern. Cut the base of the triangle into a gently-curved arc shape. Fold a piece of green felt in half and pin one side edge of the hat pattern along the foldline. Cut out the hat shape and then sew the two long edges together. Turn the felt hat inside out to conceal the seamline. Measure the circumference of the bottom edge of the hat. Cut a strip of red felt that is four inches wide and the same length as the circumference of the hat. Cut a zig zag shape into one long edge of the red felt strip. Align the long, straight edge of the felt strip along the outside and bottom edge of the hat so that the zig zags point upward, and trim off any excess red felt. Pin, and then sew the felt strip into place. Sew a small jingle bell or white pom pom onto the top point of the hat. 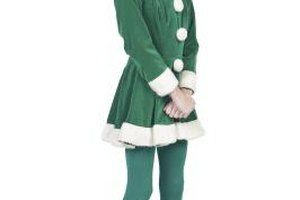 The elf tunic looks extra cute when worn with a wide black belt around the middle, green tights and a long-sleeved red T-shirt. How do I Make Homemade Alligator Costumes?